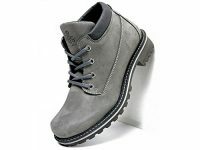 All of the men's winter, rain, dress, and casual boots you'll find here are vegan and animal-friendly. They're all free of any animal-derived materials and by-products. We even contact each company individually to make sure. 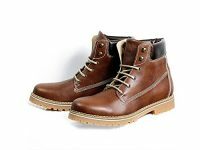 What are men’s "vegan" boots? 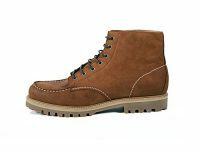 Vegan men’s boots are simply dress, casual or bad-weather boots that are made from cruelty-free materials, such as vegan leather, vegan suede, rubber and canvas, rather than animal-derived materials, such as leather, nubuck or suede. What materials are used to make vegan boots? 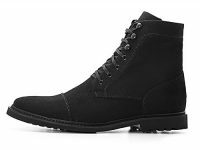 Why buy men’s boots that are vegan? When you look into the materials used to make vegan boots, as well as other everyday items such as briefcases, belts and wallets, you’ll find that the materials used to make them are often derived from shockingly cruel methods; let’s just say that animals need their skin to live. It comes down to this: if you buy vegan-friendly boots, you’re buying an animal-friendly boots. Yes! And here’s how it works; let’s say you buy some grey microsuede boots from Will's, and your friends ask where you got them. You tell them (perhaps contrary to their guesses) that they’re made from microsuede rather than real suede; “Wow, they look just like real suede!” one friend remarks. You go on to tell him where to buy them, and he buys them…this process might keep repeating as you show more people your fancy boots. You’ve now started a small vegan movement within your personal sphere of influence, whether they now it or not. As a result, a few less pairs of suede boots have been purchased in favour of microsuede boots. With enough people doing this, manufacturers, retailers and designers are all getting the message that there’s demand for animal-friendly boots; demand fuels supply for these new boots, while simultaneously eroding the demand (and eventually supply) of boots made with animal-derived materials. It really depends on the pair. 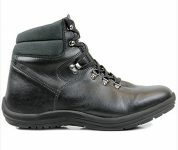 Men’s vegan boots, just like their non-vegan counterparts, are designed, produced and sold by different designers, brands and stores, and can be made from a diverse range of natural and synthetic materials. The prices of these items can vary accordingly. Should I get rid of non-vegan boots that I already own? This is as as hotly a debated topic as any within veganism. In our opinion, it’s up to you to decide. Some people can’t stand to look at leather and suede items they own after they become vegan, so wearing them becomes impossible, per say. Others feel that they already own them, and can’t afford new boots just yet, so they wait until they’ve worn the leather boots out and simply opt to get vegan-friendly ones when they need new boots. Others will sell their old boots, and either give the money to an animal-friendly cause, or use the money to buy vegan boots. There are several paths you can take, the choice is yours. 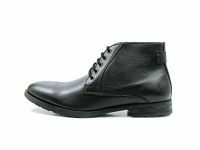 What companies make vegan men’s boots? We keep a growing list of companies that we find by way of social media, word of mouth, by old-fashioned Google searches, and by other methods, whose entire catalogue of men’s boots seems to be made from animal-friendly materials. We contact these companies to check that they don’t use any animal-derived materials in the making of their products. If we’re convinced they’re vegan-friendly, and their items are listed on Amazon, then we display them here for your convenience. We think it’s great that more and more non-vegan footwear companies are adding cruelty-free boots to their catalogue, whatever the reasoning behind it. However, when we contact some of these companies, we often have a hard time getting straight answers from them with regard to which of their products are 100% free of animal-derived materials, and which aren’t (some sneak animal-based adhesives in there!). If we don’t have complete confidence that what we list here for you is vegan, we don’t list products. We also want to be careful about sending you and other visitors to a company’s Amazon storefront with the impression that all of their similar products are vegan, just because the ones we listed are. We’ve got more helpful pages about vegan personal care products! If you or your employer makes vegan boots, shoes, wallets, iPad cases or any vegan product for that matter, we’d love to feature those products on our site... for free! Contact us at - info(at)getitvegan(dot)com - to get the ball rolling!